When you think of the sleek, gleaming appearance of today’s kayaks, it can be hard to believe that it was once a traditional watercraft, skimming over the icy seas of the Arctic. In its original form, the kayak was used by Inuit, Yup’ik, and Aleuthunters in their daily efforts to find food and to travel the frozen waters of their home. In fact, it is believed that these swift, modern-looking craft have been around for approximately 4,000 years. The boats were originally made from seal or other animal skin with a wood (or whale bone) frame and were built by their users. Nowadays, of course, kayaks are built from plastic, fiberglass, metal, wood, and even carbon fiber. The kayak was designed to be a practical, everyday working boat. And the work was likely close to home. But now, this small, streamlined watercraft is designed forfun and adventure. Andunless you have the good fortune to live near a wild rushing riveror a calm blue lake, you have to do a bit of traveling If you want to get to the water. You have tobring your kayakalong, too. To accomplish this, a kayak roof carrier is what you need. There is an incredible variety available, ranging from inflatable or foam pads thatsimply support your boat and protect your roof, to sophisticated saddle and roller systems that will not only hold your kayak securely but can also help you to load your boat onto your vehicle. In this article, we are going to focus on a J-style kayak carrier – a sturdy and easy to use type. 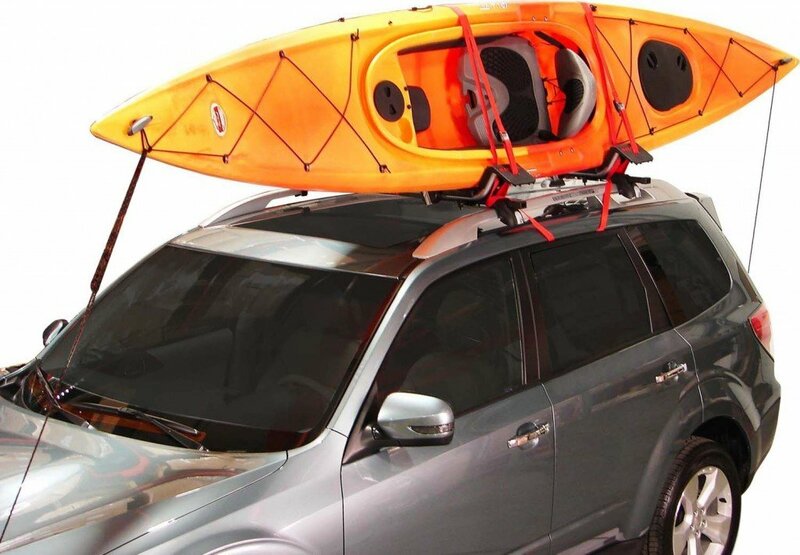 Perhaps the most popular choice for carrying kayaks on your vehicle is the J-style rack. With a simple design of a base and a support arm, shaped like a “J,” this type of rack allows you to load your boat from the side of your car. The kayak sits on its side at an angle. This leaves plenty of room on your roof to carry more luggage, bikes, snowboards,and more. J-style racks are generally very rugged and will hold onto your boat quite securely. They can accommodate larger boat sizes, too. This is a great J-style rack. 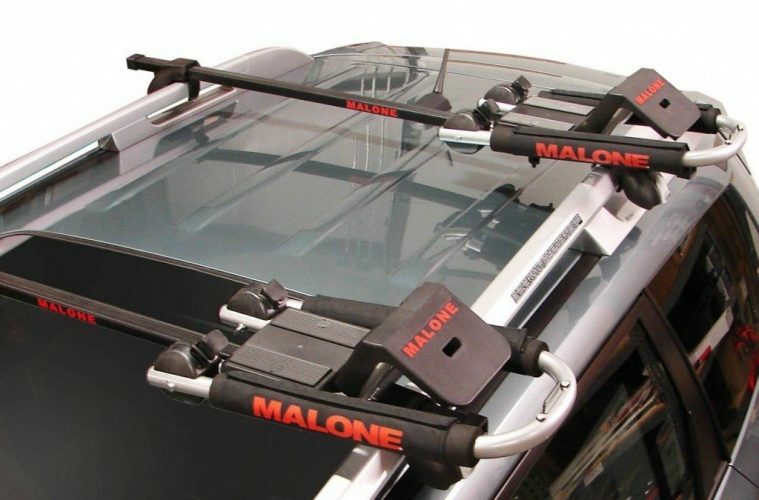 Malone Auto Racks calls it the J-Downloader Kayak Carrier.It features corrosion-resistant aluminum construction, universal fit crossbar mountinghardware, and a few convenient features that make installing and using the Downloader easier. The Downloader offers you much of what you would expect from a J-style rack: There is the easy side loading ability of other J-style racks. 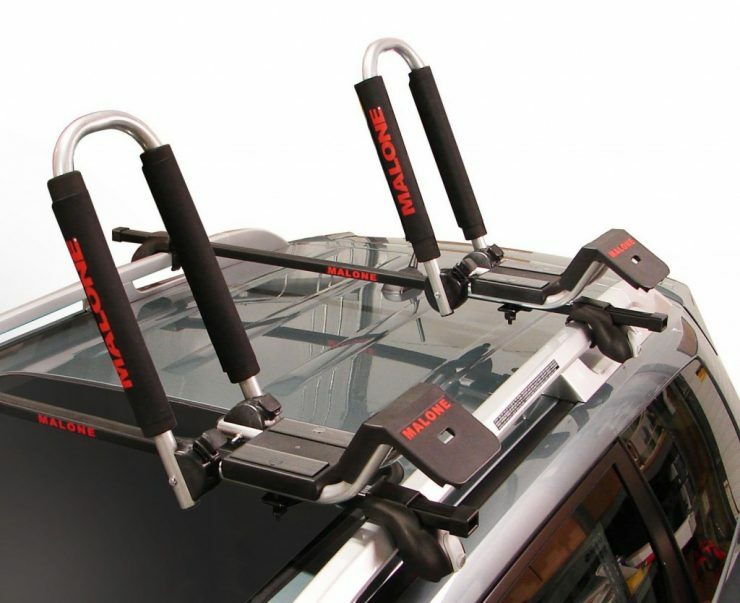 You’ll find the same space-saving rooftop storage, and the same easy installation on your vehicle’s crossbars. And, the Malone J rack very conveniently folds down when you aren’t using it, to provide low-clearance access – cuts down on the wind noise, too. And it will carry kayaks weighing up to 75 lbs. You get some help from Malone with installing the Downloader on your car or truck. The package includes two sets of hex bolts (50 millimeter and 70 millimeter) that will allow the mounting hardware to fit differenttypes of crossbars. And the JAWZ mounting hardware is designed to fit round, square and most factory oval crossbars. We like that this rack includes detailed instructions for both mounting on your vehicle (quite simple) and for securing your kayak to the rack. Have a look at them here. Malone also gives you a bit of help when it comes time to load your kayak onto your vehicle: The Downloader has a built-in “loading ramp” that makes pushing heavy boats up onto the rack easier. This is just a small inclined plane at the front of the rack, but it could make a big difference for shorter kayakers. Simple, but effective. Another nice touch: The Downloader includes extra-thick padding on the cradle arms to protect your boat from damage. The manufacturer not only recommends that you use bow and stern tie down when you transport your kayak with this rack, they tell you that failure to do thiswill void the warranty on the product. This is something to remember. 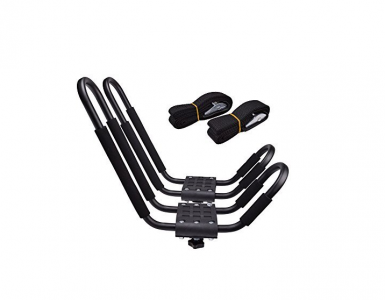 The load straps and the bow and stern tie down are included with this rack. No excuses! There were a few user complaints about the clamp system not being an exact fit for crossbars with round tops. The Malone website says: “The base of the carrier has a rectangular ‘cutout’ that has been included for square cross bar fit.” The company also tells you that the square cutout will not affect performance on round or oval shaped crossbars. You should consider, however, that performance on your vehicle may vary. It’s a good idea to check the shape of your crossbars before buying. Also, if you are interested in the Downloader and havenot yet purchaseda crossbar system, you should keep this this mind when shopping for one. Ever the helpful roof rack maker, Malone has an accessory available if the lifting required to load your rack is a genuine problem for you: the Telos Load Assist Module. 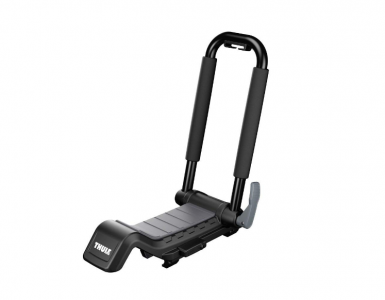 It clips onto the loading ramp of the J rack and lets you easily raise your boat up on to the rack in small increments. You only have to lift your kayak up to waist level to get it on to this device. Watch it in operation below. It is available separately. The J-Downloader Kayak Carrier from Malone is an fine choice for hauling your kayaks out to the water. It offers a host of helpful features, easy loading, and folds down to practically nothing when not in use. And you can get it for a fair price, too. Keep in mind what we heard about the round crossbars, though.